When the bunch of bananas you bought for breakfast and healthy snacking have passed their natural prime, fear not! 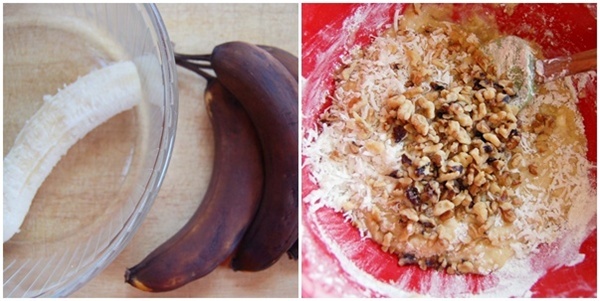 It just means the bananas are now perfect for use in delicious baked goods like breads, muffins, and cakes. I took things a step further by digging out my vintage mini-Bundt cake pan, and the results, as you can see, were quite lovely. Mashed overripe bananas, sweetened coconut, and chopped almonds are the stars of this recipe. Both quick and easy, the batter was ready for the oven in minutes. Thanks to a well-greased pan, the little cakes popped right out. I may have clapped my hands with glee at the sight of them cooling. LOOK AT THOSE CUTE LITTLE CAKES!! 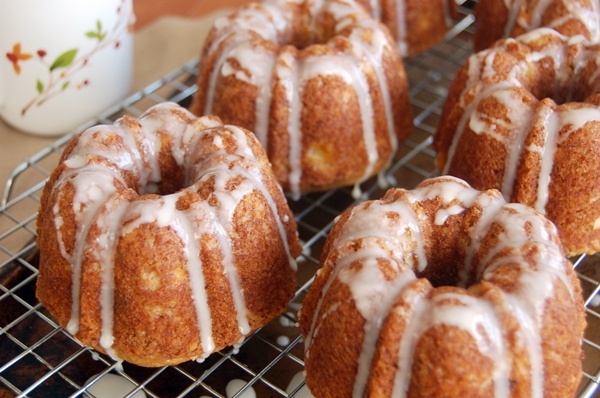 Once cooled, I stirred up a mug of glaze and drizzled it in circles over the top of each cake, letting it run down the Bundt grooves before hardening into the perfect sweet finish. Packed with banana, bits of coconut, and chunky nuts, these cakes baked up moist and full of flavor. I’ll definitely be making them again when I need an attractive, portable, and portioned way to share a banana coconut treat. 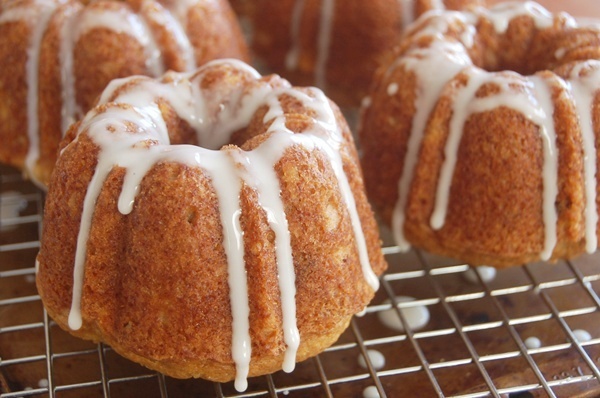 If you don’t have a mini Bundt pan (one pan holds 6 mini Bundts) this recipe also makes one standard loaf. Just increase the cooking time to about an hour. 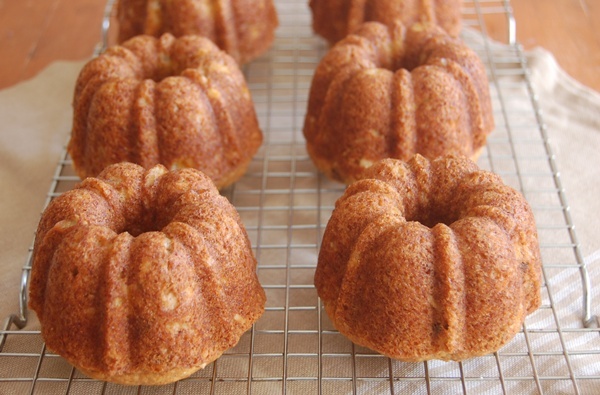 Preheat the oven to 350 degrees and grease the cups of the Bundt pans (or a 9×5-inch loaf pan); set aside. In a medium bowl, beat the eggs with a fork, then add the mashed banana, sugar, and oil until well combined. Make a well in the center of the dry ingredients, then pour the wet ingredients into the well. Using a rubber spatula, fold everything together until almost combined. Add the walnuts and coconut and fold a few more times to combine. Pour the batter into the prepared molds, and bake for 20 minutes (or 55-60 minutes for a loaf) or until golden brown and a toothpick inserted into the center comes out clean. 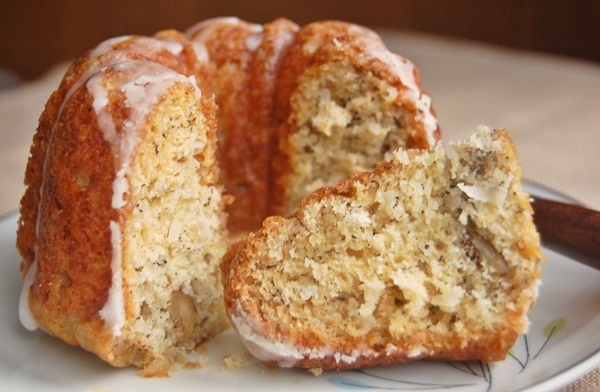 I am quite fond of banana cake, but joining it with coconut seems even better! Those are the cutest little cakes! I love to make little cakes as gifts when we visit my in-laws. These would be perfect wrapped in parchment paper and tied with a ribbon. These look delicious! I am having Easter at my home this year, I will definitely try these.